Scatter grated cucumber over a clean dishcloth (or paper towels). Sprinkle with 1/4 teaspoon of salt. Then let sit at least 10 minutes. Then, gather up the corners of the dishcloth and squeeze as much liquid from grated cucumber as possible. 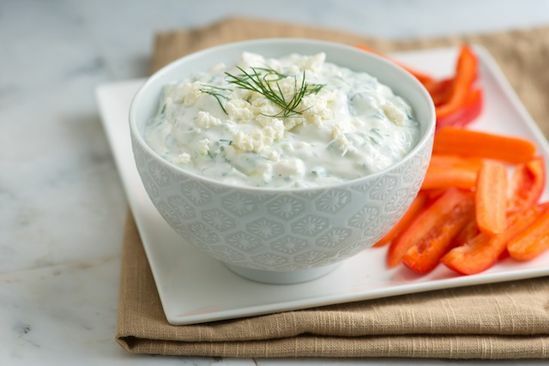 In a medium bowl, combine squeezed cucumber with yogurt, lemon juice, apple cider vinegar, chopped dill, garlic and the feta cheese. Season with 3/4 teaspoon of salt then taste and adjust as necessary with more salt. (We used about 1 1/4 teaspoons).